Back in 2014, I published a guest post from Bulgaria native and blogger Maria Stoynova. 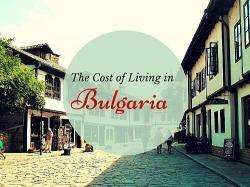 It laid out the cost of living in Bulgaria at that point, but of course things change over time. So I pulled in a few other locals this time to provide an update on what locals and expats are actually paying. This is still one of Europe’s cheapest travel destinations and one of the cheapest places to live in the world, a real bargain by European continent standards. It has a starring role in two of my books. But don’t just take my word for it. Here’s the scoop from Bulgarian residents, with Maria’s original intro below. Bulgaria is the small Eastern European country you’ve probably never heard of. This is a country with high mountains; great sea resorts, and cute, cozy little towns you will crave to visit once you see them in pictures. This little-known Balkan gem has a lot to offer its visitors. There are two main reasons to re-shuffle your travel plans and put Bulgaria on the list. #1. It’s unbelievably beautiful and charming and #2. It’s ridiculously affordable. The first one is obvious through the pictures you may have seen. It’s the second that will convince you to stay longer—or maybe even move here. The minimum wage in Bulgaria has climbed from 170 euros when we did this post originally to 261 per month today. That’s still quite low, but the actual average wage has finally climbed above 500 Euros a month at least. Bearing that in mind it is obvious that the accommodation costs should not exceed that amount. “Utilities are still about the same as four years ago, under 50€ for electric, heating, and water, though in winter it could be a bit more. he says.” Home internet service is 10-15€ per month. Outside of the center the rent decreases by around 50€ and if you venture further out the accommodation is even cheaper. It’s still possible to find a one-bedroom apartment under 200 euros on the edge of the city and you can get a house for that amount in some villages. To buy a place in Sofia averages under 100€ per square foot. While most working expats settle in the capital of Sofia, many expat bargain hunters head to the second city of Plovdiv, where rents drop by 1/4 to 1/3, the ski area of Bansko, or into smaller towns that are downright cheap. You can buy a house in many towns for under 50K euros, though don’t expect a lot of English speakers in those areas like you have in the capital. In the big cities there are plenty of transportation options to choose from. “One-way tickets in Sofia are now 0.80 EUR, though a day ticket for all lines is still 2 EUR and a great deal,” says Todor. “They also recently invented a 3-day Sofia Pass,” adds Bilyana Petrova, “which costs 10€ and besides for the transportation, it can be used for getting a discount in some places.” For transportation alone this is not a great deal, but for three sightseeing days it can save some money. See details here. Taxis prices haven’t changed much, usually 3-4 euros around Sofia, up to 10 for a ride out to the airport. To get to another city, there’s the romantic but rather slow train system, or a series of private bus companies that can get you there faster in air-conditioned or heated comfort. Both are comparably priced and cheap: you can get from one side of the country to another for less than 15 euros, with an upgrade to first class or a sleeper berth on the train being a paltry 3 or 4 euros on top the base fare. A three-hour bus ride will generally run 6 to 10€, so it’s not going to cost you much to take excursions. You can go all the way from Sofia to Bucharest, Romania for 14.50. If you’re staying a little longer in Bulgaria and plan on buying a vehicle you can find a decent used car for as little as 1500 Euros. The cost of running a car is also fairly cheap by European standards, with one liter of gasoline coming in at around 1.20€. Here are some tips from Bilyana on traveling in Bulgaria by car. Don’t forget the real sharing economy says Bilyana. “For traveling to other cities in Bulgaria such as Plovdiv, Veliko Turnovo, and Varna, there are groups on Facebook that offer shared rides—it’s usually cheaper and faster than taking the bus or the train. The famous “shopska” salad will cost you around 2€. “Most of the restaurants in Sofia offer lunch menus,” says Bilyana. “You can get only a main dish from the menu or have a 3-course lunch. For a 3-course lunch, expect to pay around 5-8 euros. Seasonal fruit, vegetables, yogurt, and meat are a fraction of the price of western European prices. They’re often organic and local because that’s the way it’s always been done. You can pick up two kilos of some items for a euro. “Weekly groceries for me hover around 20 euros,” says Todor. See his article here on Bulgarian food. If you like to drink at home or are having people over, a 500-ml beer (about a pint) in a store will run half a euro. Vodka and brandy are very cheap. “Bulgarians love to have long coffee breaks with friends that can sometimes last more than 2 hours. It’s great to catch up and take our time indulging in doing things like going to the cinema which only costs around 3 to 5 euros,” says Maria. If you’re feeling like doing something a little fancier a ticket to the theater can be found for 5 to 10 euros. Movie tickets are 11-12€ for 2. Going back to that 500 euros per month average salary, imagine how you look in comparison if you’re getting two social security checks for $1,200 each. Or think how absolutely loaded you are if your online business is netting 3,000 euros per month. In London or New York on that amount, you’re next to broke. In Sofia, you’re the rich guy (or gal) at the party. You won’t have to second-guess your health care in Bulgaria. A visit to the doctor will generally run between 15 and 50 euros, the high end being for a specialist who speaks English. Dental care is a tiny fraction of what it costs in the USA. You can also get a maid to clean your place regularly for well under 5-8 euros per hour. A guy will spend 7-8 euros for a haircut in a nice business neighborhood, less in a working class one.